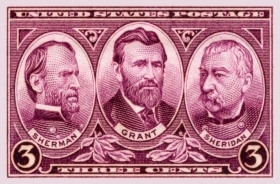 Initially, one may be inclined to believe that such a title may have something to do with the temperament of Phil H. Sheridan, who was said to have a relatively short fuse, however, in 1937, years after Nellie made her first bid to the post office as Somerset’s Postmistress, Civil War Generals Sherman, Grant, and Sheridan were depicted on a postage stamp. Can you imagine the pride of an aged Nellie as her favorite, “Uncle Phil,” graced a postage stamp? While the naming of Sheridan High School was a small tribute bestowed upon Sheridan from his hometown, Somerset, Ohio, would have been a great honor to the Sheridan family, the postage stamp would have a deeper significance for an aged Nellie, who not only was born in the childhood home of Sheridan and lived on what became Sheridan Ave., (South St.) in Somerset, had a statue erected and dedicated to his memory, but now had the luxury of seeing her famous relative on a postage stamp! I am sure she purchased several and was very excited over the notion of it. Here is another depiction of the stamp in “Union Blue.” The above red stamp was how the stamp was originally distributed. It is also worth mentioning at this point that Phil Sheridan clerked in the store, which would later serve as Wilson and Brehm, which was the store owned and operated by Nellie’s late, beloved husband, T.C. Wilson. 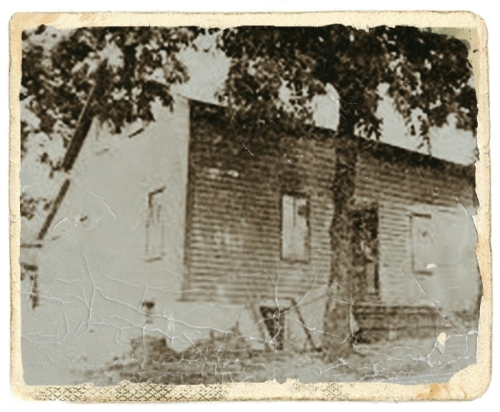 The building also held the Somerset Post Office. Nellie would own the building until she died.